French meringue is the easiest, simplest meringue to make as it doesn’t require cooking during the whisking process. The ratio of sugar to egg white can range from 1:1 to 2:1 depending on what the meringue will be used for and also personal preference. Some prefer meringues much sweeter than others; just bear in mind the more sugar you add, the denser the meringue will be. French meringue is the least stable of the meringues, which means that it very quickly begins to disintegrate if not used straight away. For best results use on the same day of making. French meringue is best cooked at a low temperature to ensure the middle is cooked before the outside begins to brown. Meringue doesn’t just have to be baked, it can be folded into desserts to add lightness – Pierre Koffman uses it for his classic Oeuf a la neige. 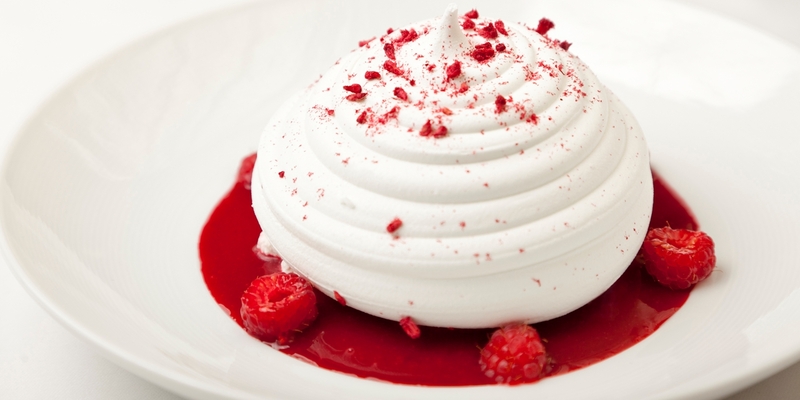 For a simple summer dessert, look no further than a classic British Eton Mess. Try Marcus Wareing’s version with raspberries or Geoffrey Smeddle’s Eton mess with autumn figs. Galton Blackiston adds coffee to his meringue and serves with a tangy passion fruit cream.